As the philanthropic landscape evolves, many people assume direct mail is a thing of the past. That couldn’t be further from the truth! Direct mail is still the channel through which most new donors are acquired and cultivated, continuing to be the backbone of direct marketing. But the story doesn’t end there. As demographics shift with our aging population and “Next Gen” donors gain more discretionary income, it has become essential to take an integrated, multi-channel approach to direct response. Organizations need to provide their donors with the most convenient possible way to say “yes” to making a gift and follow through as soon as they are inspired. This doesn’t mean giving up print as it remains a primary motivator for both online and offline gifts, but it does mean that the most productive and sustainable direct response programs now include a full complement of offline and online tools. Touchpoints through mail, email, digital media, social media, phone and in-person all work together to engage donors where they are. However, we can’t lose sight of where our efforts will pay off the most. A recent study by Blackbaud about generational giving found that while it’s true Millennials are more likely to give online, GenX, Baby Boomers and Matures still provide 89 percent of total giving and must be the primary focus of fundraisers if we are to continue growing our base of support. In the same Blackbaud study, Millennials identified that direct mail is still an appropriate form of communication, but they prefer to go online to make their gifts. 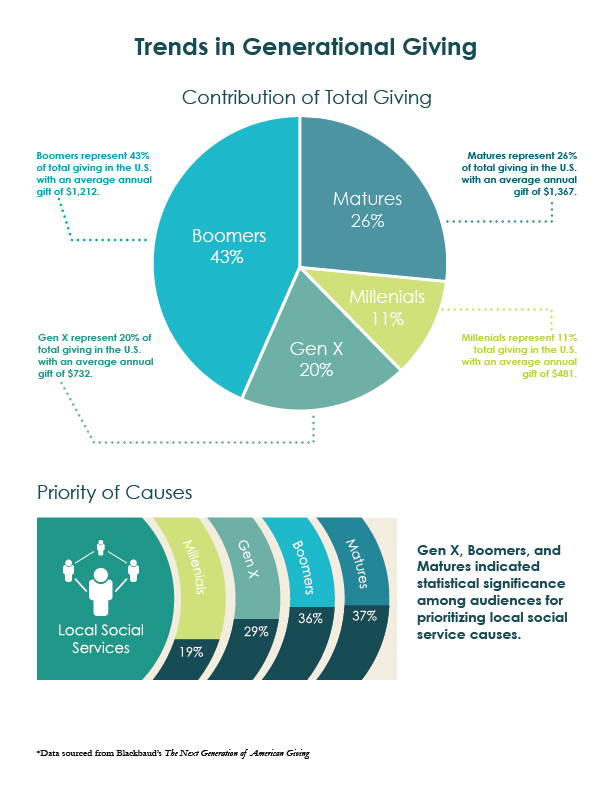 Brad Cecil & Associates has been carefully watching generational giving trends for our clients. In 2017, we found that around age 52, the same number of donors gave offline as online. Younger than that, the scale tipped slightly in favor of more online donors, and older than that, more donors give offline. The increasing age of online donors (up five years from 2016 in some cases) is encouraging for the future of online giving. As donors age, the younger donors who were the first to become comfortable with online giving will reach an age where they have discretionary income and become more generous. This principle has held true for direct response from the beginning – donors have always “aged into” giving through direct response, regardless of the giving channel. But it’s very important to point out that a large percentage of online gifts continue to be motivated by direct mail. Take away direct mail and your online giving will dramatically decline. We typically see between 10 percent and 30 percent of response for a direct mail campaign come in through online gifts that can be tracked back to a direct mail motivator. For year-end giving, that percentage increases as donors find it easier to make last-minute gifts online rather than standing in line at the post office to ensure a December 31 postmark. It is important to employ multiple channels when acquiring new donors as well as to retain existing donors. In fact, donor retention is hands-down one of the most important aspects of a successful fundraising program. The better an organization’s retention, the higher long-term donor value will be. Because donors are acquired through various channels, we must also strategically evaluate data to determine which giving channel(s) retain the most donors. 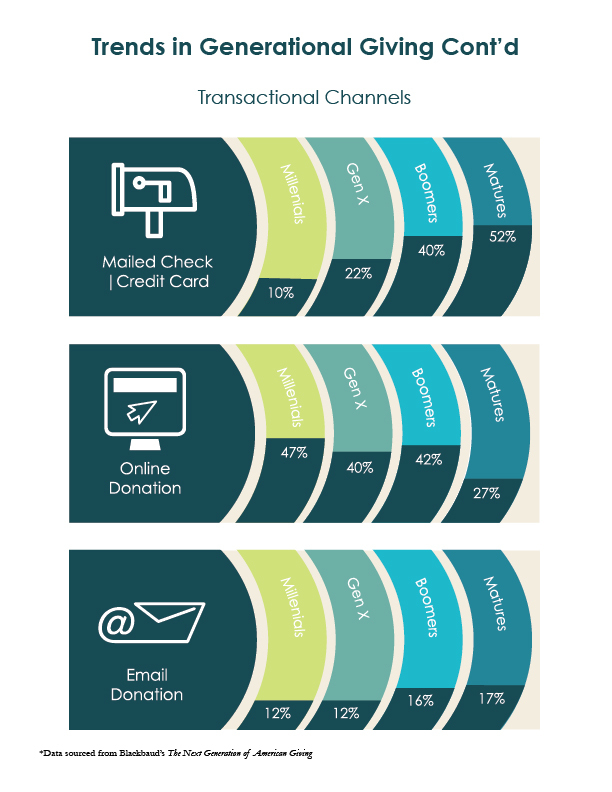 Not only do retention rates vary widely depending on which channel a donor is acquired through, but retention is also greatly affected by the number of channels through which the donor chooses to give. For those donors who gave both in response to direct mail as well as a separate online gift in their first year, retention in 2017 was an incredible 78%. Similar results have been seen for many other organizations we looked at, including one as high as 90% new-donor retention for donors who made both an offline and online gift. The data shows that it’s clearly important to focus on converting first-time online donors into multi-gift/multi-channel donors in order to improve overall retention. Even as more donors may be making first gifts online, direct mail is as important as ever. The following online and offline strategies are proven to improve both new and multi-year donor retention. When organizations implement robust solicitation and cultivation plans using both print and digital channels, mid-level donors flourish. Maintaining mid-level donor relationships through the mail by tailoring frequency and asks has been the most productive, and the growth our clients have seen in mid-level giving programs is exciting and encouraging. Hands-down one of the best ways to keep donors long term is to get them to automate their giving. Inviting donors to join a special sustaining group through both mail and email invitations has proved incredibly successful for our clients. But it doesn’t end with getting a donor to sign up – keeping monthly donors and upgrading them annually requires frequent touch points and plenty of feel-good feedback. By all means, make monthly donors feel special! When you do, they’ll become not just faithful friends right now, but they’re more likely to consider your organization in future estate plans, too. One of the first steps in improving new-donor retention is the implementation of both online and offline welcome kits for all new donors. The welcome kit should be sent within the first month of receiving a new donor’s gift and include more information about the organization, a “supporter” gift such as a window cling or magnet, and an opportunity to give again, become a monthly donor, volunteer or request additional information. If you have an email address for that donor, you should also have an email welcome series ready to go that includes an initial email thanking the donor and sharing more information and links to the website, a second email with a welcome that invites them to an event or to take a survey, and a final email presenting a giving opportunity. Since we know retention is better when we are able to convert an online donor to give both online and in response to a direct mail motivator, it is important that online donors also receive a printed welcome kit in addition to the digital version. An aggressive winback strategy should be employed before recently lapsed donors become deeply lapsed. This should include multiple personalized direct mail appeals to recently lapsed donors throughout the year and special call outs at year-end for those who have given the previous year but have yet to give in the current year. We have seen strong results from monthly winback cards to all donors who reach their thirteenth month since their last gift. These personalized cards not only break even, but positively impact future giving from the donors who receive them. Effective email, data-driven social media strategy, targeted digital banner ads, dedicated landing pages and the effective use of Google Grants will increase your digital presence. Email remains the workhorse of the online fundraising world, but other digital tools are key to building both awareness and your email list. Facebook likes and banner ad clicks can result in donor conversions with the right strategies in place to meet prospects where they are and motivate them to take the next action, which is ideally to volunteer their email address! With a goal of the best possible retention, we must also continue to include all online donors in every channel of direct response, including mail. We recommend a high level of personalization of mail for donors who have given their first gift online with custom language targeted at this unique constituency. Even though direct mail responsive donors have very strong retention already, since the data shows providing multiple channels to give improves retention, all direct mail pieces should offer options to give on-line. A very specific donor-focused newsletter is important to the overall success of an organization’s direct marketing program. A donor-focused newsletter works to complete the donor cycle: First donors are asked for gifts through direct response appeals, and then the newsletter reports back on how their gifts translate into changed lives. Not only do donor-focused newsletters increase newsletter revenue, but they work to increase average gifts for subsequent direct response appeals because donors have clearly seen why their gifts matter. Each newsletter should have a print, email and online version so that donors can engage with the content through multiple channels. With the evolving face of direct response, it’s more important than ever to utilize both time-tested strategies and newly emerging tactics. The answer is not to invest in either direct mail or digital, but both in concert with one another. A fully integrated direct response program should be consistent in look, feel, brand and message across all platforms. Brad Cecil & Associates’ experienced team of fundraising experts is uniquely positioned to cultivate donors through every channel and at every level…from $5 to $5 million. We consider it a privilege to serve each and every one of our distinguished nonprofit clients and we’re honored to explore the changing landscape of fundraising alongside them every day.